What else is new in the garden this year? I’m trying Geranium ‘Johnson’s Blue’ for the third time. This plant makes all sorts of top plant lists, but I have killed it every time I’ve brought it home. 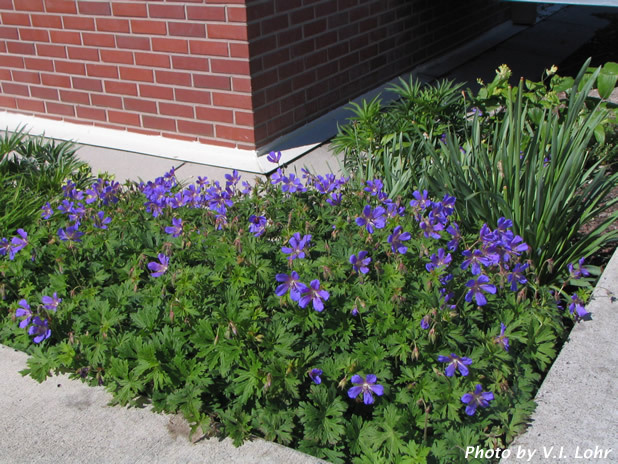 It should grow 15-18″ tall and about 24″ wide, with blue-violet flowers and finely cut leaves. It’s in the blue garden (of course) where it’s getting some dappled morning sun and a limited amount of late-afternoon sun. I don’t think it will burn up where it’s sited, but I can’t make promises. For the blue slope, I picked up three Euphorbia ‘Blackbird,’ which should grow 15″ tall and wide. It has deep reddish-purple laves and bright green flower bracts edged in red. At least, that’s what the tag shows. I have grown rather dedicated to Euphorbias over the past few years as they have proven to have the resilience I demand in garden plants. Also in the blue slope are two new Dianthus gratianopolitanus ‘Firewitch.’ These have very fine, almost wiry, steel-blue foliage and bright magenta flowers. The foliage is evergreen and theoretically should form a dense little mat. In the pink-purple-and-yellow garden in the back, I’ve added Oxalis ‘Charmed Velvet.’ I am not impressed with the name. It should provide a dark purple shamrock groundcover about 12″ high and wide. I hope it will mix in an interesting way with the Saxifraga stolonifera strawberry begonias I bought back in the winter during a warm(er) spell. Both have starry white flowers, but the Saxifraga has silvery-marbled leaves and grows much lower to the ground. Their leaves have purplish tints to their undersides. I hope these will slowly take over the bed and provide an attractive evergreen groundcover. I carry in my mind the scornful words of the great English landscape designer Penelope Hobhouse, who once questioned an American client, “Why do you Americans like to show off your mulch?” But it takes time to fill the space.